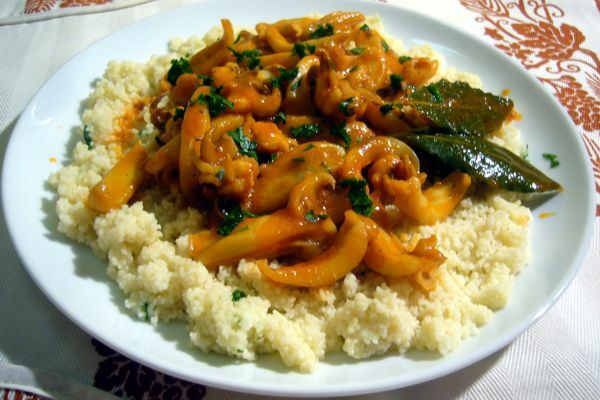 Cuttlefish stewed with tomatoes: a proposal for a hot entree that reminds a soup, but much more quickly and cheaply. Obviously can become a main course, it just increases the amounts used. We can serve you with home made bread, or as I did with the cous cous. Easy 4 people 10 min. Depriving the squid eye and beak (expect to use already cleaned cuttlefish. The weight indicated in the ingredients is in fact referred to the already cleaned fish and peeled). We wash the cuttlefish under running water and cut the body into strips, leaving whole heads. We clean and wash the parsley and finely tritiamo. Let fry and add the squid and the bay leaves. We go up, we do pepiamo and cook on high heat for a few minutes. Add the white wine, let it evaporate and continue cooking for another minute 15 wetting gradually with the comic (or broth) fish. NB: If you do not have the fish stock, we can use hot water. If we are also preparing other fish dishes, and we discard, it is good to go, before you start cooking, preparing a good fish stock we need for the different preparations. We at this point the tomato and mix. We add a similar amount of fish stock, we lower the heat and let simmer for another 20 minutes. These are flat rates. In fact, the cooking time will vary depending on the consistency of the pulp. It 'good to try cooking putting the squid with a fork: if it is cooked soft. When cooked, add the chopped parsley keep aside a little. While the cuttlefish is completing the baking, prepare the couscous in a pan putting the cous cous, a little olive oil and sprinkling with 2 cups fish stock. NB: check the preparation mode as indicated in the package. As the couscous absorbs the liquid, sgranarlo with the tines of a fork. Leave "inflating" for a few minutes, the liquid will be absorbed completely by transferring the cous cous fish flavor. Serve by placing the bottom of the dish an even layer of cous cous and cuttlefish center with their sauce.